My expenses and Subterranean Press are not on the best of terms. There isn’t a question about Subterranean Press not having an attractive catalogue of titles, on the contrary, I can constantly find excellent writers and interesting titles among their publishing work and the editions I acquired over time are very beautiful and come in an impressive presentation. However, I always found their pricing a bit too much for me and it takes a little more effort to stretch my finances in that direction. There are some titles published by Subterranean Press though for which I am willing to push against my expenditure limit, I did it last year with K.J. Parker’s “Academic Exercises” and I’ll do it again this year for K.J. Parker’s “Savages”. How could I not? I am a great admirer and an avid reader of K.J. Parker’s works, her/his fiction is full of intricate details with amazing and wonderful effects on the grand plan of the plot, the characters are always lively protagonists, excellently rendered, often resourceful and ambiguous in their morality. I find myself unable to point out one such character I haven’t fall in love with. “Savages” is K.J. Parker’s latest novel, an epic fantasy that promises more treats in the line of this brilliant author, a richly detailed story with an intriguing worldbuilding and exciting characters. Extreme odds, politics, intrigue and deception, colorful characters such as a master military strategist, a pacifist who inherits an arms business, a forger and corrupt bureaucrats are all elements that pick my interest for any fantasy novel, but when such a novel has K.J. Parker’s mark on it I can say with precision that I am not ready to let this title pass me by. Perhaps “Savages” would be available from another publisher too, with a more accessible pricing, but since I have no patience when it comes to K.J. Parker’s recently announced works I’ll start turning my pockets and wallet inside out while giving them a big shake in the process, even more so considering that the Subterranean Press edition is limited to only 1000 copies. An unnamed man wakes to find himself facing the loss of everything that matters most to him. Against all odds, he escapes with his life and heads out into the turbulence of the wider world, recreating himself, step by step, as he goes along. That wider world is dominated by an empire that has existed for decades in a state of near perpetual war. A host of colorful characters will help to shape the destiny of the empire, and its constantly shifting array of allies and adversaries; among them, a master military strategist, a former pacifist who inherits his father’s moribund arms business, a beautiful forger and a very lucky counterfeiter. Each of them, together with corrupt bureaucrats and the nomadic 'savages' of the title, plays a part in a gradually unfolding drama of conflict and conquest played for the highest of stakes. 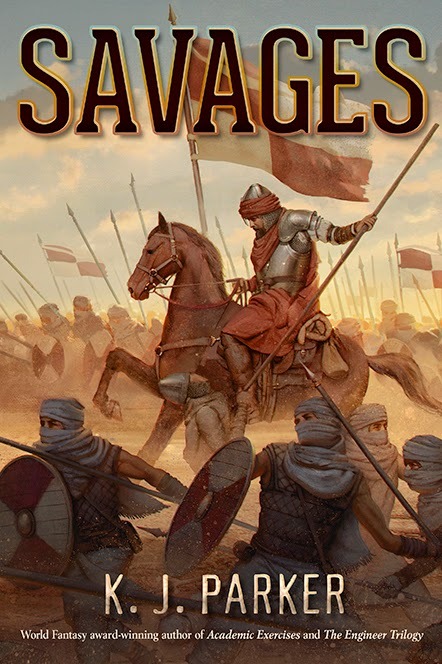 A story of war, politics, intrigue, deception, and survival, Savages is a hugely ambitious, convincingly detailed novel that is impossible to set aside. Filled with schemes, counter-schemes, sudden reversals of fortune, and brilliantly described accounts of complex military encounters, it is, by any measure, an extraordinary entertainment, the work of a writer whose ambition, range, and sheer narrative power have never been more thoroughly on display.